I never order fried rice at restaurants. When I was a kid, a friend told me that restaurants use customers’ unfinished rice in their fried rice. Day-old, cold rice is preferred over just-cooked, hot rice in fried rice. 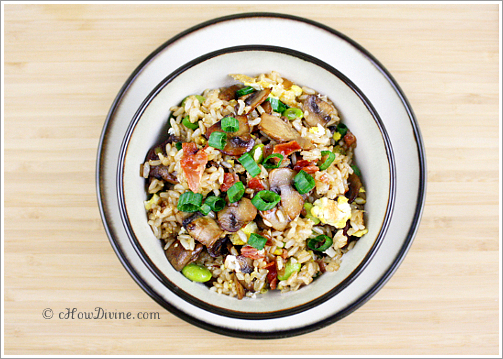 And if you cook it all up with other ingredients – as in fried rice – no one would be the wiser. So it seemed feasible. I really hope this was an urban legend; but I haven’t taken any chances. I’m a germaphobe, always have been. And if the story was an attempt at a joke, it was cruel. She knew I was a germaphobe! Anyway. After hearing the story, I had a mini freakout/meltdown and haven’t ordered fried rice since. One good thing came out of it though. I’ve become pretty deft at making all types of fried rice. And I love the simplicity of fried rice. You have all you need – starch, veggies, and protein – in one dish. I also love the taste, of course. 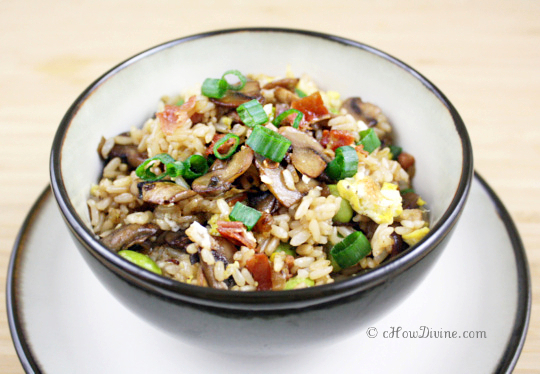 I’m especially fond of fried rice with any type of sautéed mushrooms. They are just soooooo savory; and they are excellent at absorbing whatever flavors you add to the dish. Additionally, there are numerous health benefits associated with mushrooms. Satisfy your appetite while doing something good for your health! *Note: rice should be dry and not sticky when cooking fried rice. I have used just-cooked, long-grain rice when I didn’t have any cold rice on hand. They are naturally drier in texture. Heat a large non-stick pan on medium-high heat. Add just enough oil to coat the bottom of the pan. Sauté chopped prosciutto, pancetta, or bacon until crispy. Set aside. In the same pan, sauté chopped onion and white part of the scallions with a little bit of oil. A teaspoon or two of oil will do. Once the onion is lightly browned and translucent, add the mushrooms. 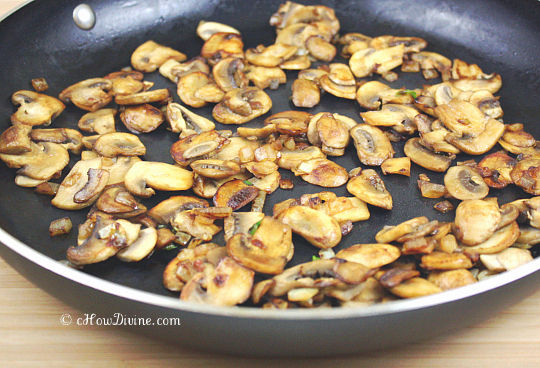 Sauté mushroom until the mushrooms are golden brown. Make sure you are doing this on high enough heat to prevent the mushrooms from sweating. Add a dash of salt and a teaspoon of soy sauce. mix well. Add edamame (or peas) and stir until well heated. Add rice and mix until well combined. Spread out the rice mixture thinly on the pan. Let it sit until the rice turns gold brown. Once golden brown, mix well and push the rice to the edge of the pan, making a well in the middle of the pan. Add a drizzle of oil. Crack the eggs in the middle. Add salt and pepper. Scramble and let it sit until it JUST sets. When it just sets, break up the egg with a wooden spatula and mix the egg into the rice. Add ~2TB of soy sauce. Mix well. Add green parts of the scallion and a healthy dose of fresh black pepper at the last minute. Mix to combine. Divide among 2-4 plates or bowls. If needed, add salt to taste. Serve while hot. Thanks Erin! It works great with just about any “meaty” mushrooms. Sauté until golden brown and add whatever flavor you’d like!